Blackjack is one of the most popular casino games of all time due to the fact that it is both challenging and exciting. It is played by hundreds of players all over the world which led to the emergence of a number of interesting variations. Nowadays, it is possible to enjoy this enthralling card game at almost every land-based casino as well as online. It has never been so easy and convenient to play blackjack as presently, you have the freedom to choose when, where and how to enjoy it thanks to the many mobile casinos. The online casinos undoubtedly offer many new opportunities for players which is the reason why they have gained in popularity so much over the years. Thanks to them, you have the chance to play a number of exciting casino classics and other exclusive games online at any place and time. There is no need to go all the way to a brick and mortar casino any more in order to win big. 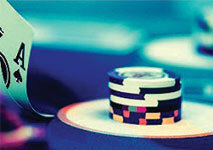 The online casinos provide you with such a great opportunity as they offer progressive jackpot games. Nowadays, even skill-based games such as blackjack feature impressive jackpots which you have the chance to win by placing a side bet. Progressive blackjack is one of the most exciting casino games due to the fact that it gives players the unique opportunity to win big. The main difference between the classic game and this variation is that it usually features a massive jackpot which increases every time someone plays. Whenever a player wins its entire amount, it is reset to a pre-determined sum which grows bigger until someone gets lucky again. Usually, the online casinos don’t impose any restrictions on the amount that the progressive jackpot can come to. All of the players who would like to compete for it are required to place a side bet which is separate from their initial wager. The basics of the progressive blackjack version are the same as in the classic game. 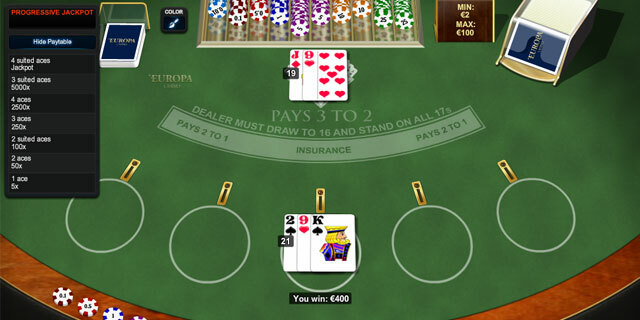 You compete against a dealer and your main objective is to manage to beat his hand’s total. Your first priority should be to form a strong hand whose total is as close to twenty one as possible if you want to become a winner. Another way to win is if the dealer busts or in other words, if he has a total which surpasses twenty one. If you go over this number, you lose automatically as well. This progressive game can be played with up to eight packs of cards, depending on the casino’s rules. The most widespread variant which can be found in various online casino uses six decks. At the beginning of every game, you are required to place your main bet. After that you are dealt two face up cards while the dealer is dealt one face up and one face down card. The card which is not visible to the players is often referred to as a hole card. In progressive blackjack just like in the classic game, your initial option is to either hit or stand. If you choose to hit, you are dealt one more card but if you stand, your total remains the same. It is also possible to double down your wager or split a pair. In this game, you can double down by placing a bet which is equal to your initial wager. You can also perform this move after splitting, however you are not permitted to double down if you have blackjack. Usually in progressive blackjack games, you are allowed to split any two identical cards, including aces. However, it should be noted that you are deprived of the option to re-split. You have the chance to take insurance when the dealer is showing an ace but you are not allowed to surrender in any case. When it comes to the dealer’s play, he is enforced by the rules to stand on all 17’s. You should bear in mind that this rule can differ from one casino to another and it is always a good idea to double check it before you start playing. In progressive blackjack games, you have the opportunity to win big by placing a side bet which is separate from your original wager. In most cases, you are not enforced to put this bet and it is entirely up to you to decide whether you would like to have the chance to win the progressive jackpot. Usually, the amount that you are required to wager for this side bet is $1. The size of your wager is divided into two parts, both of which contribute to the progressive jackpot in different ways. Most of the amount of your side bet goes to the current jackpot and it increases its size automatically. This is the reason why progressive jackpot games usually feature a substantial sum which grows rapidly over short periods of time. The other part goes to the ‘seed’ or in other words, it contributes to the initial amount from which the progressive jackpot starts building up. When it comes to side bets, it should be noted that their payout can vary, depending on the particular casino and the version. Perhaps, due to the fact that the ace is the most powerful card in the deck, it plays a crucial role in progressive blackjack games. In general, the more aces you manage to collect in your hand, the bigger your profit will be. It is clear that the payout also depends on the number of aces you have in your hand. Most online casinos pay out 5 to 1, if you have one ace which is the smallest profit you can make by placing this side bet. In case that you have managed to get two aces, the payout is 50 to 1. This means that by placing this optional side bet which amounts to $1, you have the opportunity to win $50. The payout for three aces, regardless of their suit, is 250 to 1 and for four aces – 2500 to 1. Since your chances of getting aces of the same suit are much lower than receiving two different ones, the payout for this type of combinations is more generous. If you are dealt two aces of the same suit, you will get $100, providing that you have put this side bet of $1. For three suited aces, the payout is quite impressive – 5000 to 1 which makes this optional bet worth placing. If you are among the luckiest players who manage to get four aces of the same suit, then you will win the entire amount the progressive jackpot has accumulated so far. If you decide to play a blackjack game which features a progressive jackpot, there are a few important things which should be considered. First of all, the house edge is the same as in the classic game – less than 1%. Therefore, your chances of winning are no different and you can still influence the outcome of every hand. You can apply your strategy with the same success and it will be just as efficient as if you were playing the traditional game. It is worth reminding that you have the chance to win a progressive jackpot, only on the condition that you place the respective side bet for it. When it comes to this optional bet, many players are rather sceptical and refrain from placing it as they believe that they stand no chance of getting four aces of the same suit. While it is true that it is very hard to get four such aces, it should be noted that it is not impossible. Considering that the game is played with six decks of cards, you have realistic chances of getting four aces at once. Moreover, in order to place this side bet you will lose as much as $1, however you can win a life-changing amount. The exact size of the progressive jackpot strictly depends on the particular casino and the time at which it is won. Progressive blackjack is one of the most thrilling games that you can find in numerous online casinos. The reason why it appeals to some many players worldwide is that it gives them the opportunity to win a substantial sum by playing their favorite casino game. All that you need to do is to simply place the respective side bet and hope for the best. In the meantime, you can enjoy blackjack as usual and concentrate on beating the dealer. Bear in mind that if you want to make the most of every game, it is essential to use a strategy and apply it throughout the game. If you make the decisions for your moves based on your gut feeling, you will most likely end up losing.